Comments Off on Can I Trust My Conscience? In the 16th century, two celebrated spiritual leaders, Martin Luther and St. Thomas More, stood on opposite sides of the religious debates of their day. Ironically, they took their stand on the same principle: an appeal to conscience. Luther died outside the Catholic Church because he claimed that his conscience compelled him to oppose the Church. More died a martyr because he insisted that his conscience forbade him to oppose the Church. Today, the cry to stand on conscience, especially with regard to socially contentious issues, is heard more and more among Catholics and others as well. Yet just as it was in the time of Luther and More, the conclusions drawn according to individual conscience are often contradictory. How is it, then, that trusting one’s conscience seems both perennially essential and dangerously unreliable? Consider this analogy. I’m 6 feet 4 inches in height. Most people consider me tall, but in my mind’s eye I’m just average height. In fact, whenever I encounter others of my height, I think of them as taller than I am. For most of my life, you see, my normal line of vision has tilted down as I look into the faces of family and friends. What seems, then, to be “level” or “normal” in my mind is skewed slightly downward. My perception of height is thus not objectively accurate, but rather subjective, relative to my experience. If I had spent my life with mostly taller people or mostly shorter people, I would probably have become accustomed either way to think of myself, in my mind’s eye, as their height. Given this situation, if I were to stand before a large mirror alongside others, I’d be surprised at what appears there. No doubt I would then look around for a reliable measuring instrument, some kind of yardstick, to determine accurately how my height compares objectively to that of the others. Only then could I correct that warped lifelong perception of myself and others. In a similar way, the perception of right and wrong that we call our conscience can become untrustworthy. Over the years, it tends to adjust to the world around us, in ways to which we are dangerously blind. Sometimes our conscience bends to be more like those whom we admire or who admire us. Sometimes it bends away from those whom we despise or who despise us. Either way, our conscience is skewed in ways we don’t recognize. Scripture recognizes this problem when it speaks of consciences that are “weak,””wounded,””branded,””tainted” (see 1 Cor 8:7-12; 1 Tm 4:2; Ti 1:15). So how do we gain a trustworthy conscience, a vision of right and wrong that is accurate? Most people are unwilling to examine and correct their consciences until they become aware, through direct confrontation with another person’s conscience or some other “Aha!” experience, that “there’s something wrong with this picture!” Such an experience is like standing before the mirror. Having recognized the problem, we must regularly examine and form our conscience by using a reliable moral “yardstick”- an objective means of measuring what is right and wrong. But practically speaking, what kind of yardstick is available? Luther claimed that we must use Scripture alone to form conscience. But we need only observe the chaos of Christian opinions on critical moral issues to see that Luther’s sola Scriptura principle has proven perpetually untrustworthy as a means of forming conscience. Merely private scriptural interpretation is simply too subjective. Others say that the best way to form conscience is to ask “WWJD?” or “What would Jesus do?” Yet this approach can be just as subjective and shaky as sola Scriptura. We should ask instead, “What did Jesus do?”What did He do to provide us with an objective means to measure truth and form a faithful conscience? The answer, of course, is that He gave us as a trustworthy yardstick “the church of the living God, the pillar and foundation of truth” (1 Tm 3:15). If we study and embrace the Church’s precepts, and all the authoritative moral teachings of the Church, we’ll form a conscience on which we can confidently take our stand. Marcus C. Grodi is host of the popular EWTN program “The Journey Home” and president of the Coming Home Network International. Comments Off on What Does It Mean To Be Truly Free? We are all born into captivity. And we don’t even know it. We are not nearly as “free” as we like to think we are. Each of us is born enslaved to ourselves and thus have become complicit in the rebellion of the fallen angels against their Creator and ours. It’s a subtle and insidious enslavement; none of us rolls out of bed in the morning consciously thinking, “I am the center of the universe,” and yet almost all of our desires, choices and actions are governed by this diabolical assertion. And the assertion, like all things diabolical, is a lie. Far from being always so obvious to us, original sin is very much like a virus that affects our entire operating system, lurking behind the screen of our life and manifesting itself in our serial sins as well as greater offenses — it distorts the way we see ourselves, the world and God. As postmodern persons, we are remarkably self-conscious and yet bereft of genuine self-awareness. We don’t really see ourselves because we are, ourselves, “in the way.” The “ego,” what Thomas Merton called the “false self” — the “me” that is at the center of this lie — occludes our vision so that we don’t see even ourselves as we should. Our vision of others also is skewed, and so we end up looking at others either as objects in the way of the exercise of our will (competitors) or as instruments we can use to achieve our own ends. In some ways, the art of Christian living is learning to stay out of the way. Far too often we imagine that God’s grace works something like this: our unruly desires and passions lead us into any number of sins, in thought, word, action and omission. God’s grace enters in and acts as a governor, limiting our choices — clamping down, as it were, on that freedom and thus keeping us on the “straight and narrow.” However, rather than imagining grace as a kind of power that limits us by external constraint, perhaps we might re-conceive divine grace more helpfully. In baptism, we were plunged into the dying and rising of the Lord Jesus Christ and configured to Him. We share, by His gift, in His risen life, the life of the world to come, the new life made possible by His own paschal victory and now extended to us by the sacraments. Perhaps rather than seeing grace as an external constraint, we might rather view it as it really is: the fruit of the new life given to us in Christ. To be “in Christ” (one of St. Paul’s favorite expressions) is to share in His new life — His victory and triumph over sin. Grace, far from acting as a kind of inhibitor, actually liberates us and makes us free, genuinely free. When Gabriel greeted Our Lady with the strange Greek epithet kecharitomene, usually rendered “full of grace,” he was observing her unique status among all the daughters of Eve (as well as among all the sons of Adam): Mary is most graced. And yet we must not read that to mean that she was somehow less free. Mary is actually the freest human person who ever lived, and that is precisely because she is most graced. Grace does not inhibit or create curbs for freedom, it liberates it. The saints are those who have entered into this genuine freedom in Christ. They are not constrained or cramped by grace. Quite the contrary, they are men and women who have moved from servile to filial love — their relationship with the Lord is not one dominated by rules and regulations, but rather is informed by the New Law, the law of love. It is this love that is the motivating factor of moral action in their lives. It would never dawn on them to think, “What’s the minimum I need to do not to be damned?” Rather, they are moved and drawn by love, a love for Christ that first comes from Him — a divine love, the agape of the Gospels — and this is what forms their life. The “operating system” in the life of the saints is no longer sin, but it is this love and the grace and freedom it brings. In his encyclical Veritatis Splendor, St. John Paul II recognizes that the relation of truth and freedom has been constant in the Church’s teaching: “Only the freedom which submits to the Truth leads the human person to his true good. The good of the person is to be in the Truth and to do the Truth” (No. 86). This flows from Jesus’ own words: “You will know the truth, and the truth will set you free” (Jn 8:32). In a culture that exalts in independence and autonomy, and in which the uninhibited exercise of freedom is the golden ring for which all unreflectively strive, the Gospel invites us to discover freedom precisely in relationship: We are most free when we live in relation with God in Christ. 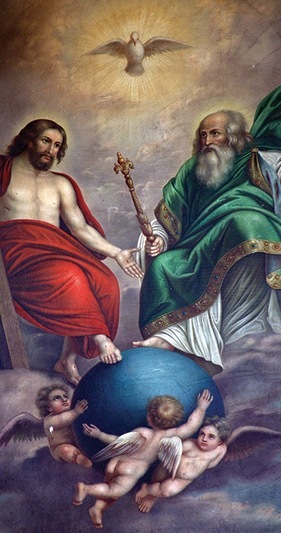 The Christian faith holds that the Holy Trinity — God: Father, Son and Holy Spirit — is the fullness of what it means “to be,” and thus “to be” in the fullest sense is “to be” precisely “in relation.” For us who by grace are offered a created share in that Uncreated Life (what Tradition would call deification or divinization), true freedom is discovered only as life in Christ, the supreme grace, by whose Spirit we have been liberated from the grip of sin and death, and through whom we have a unique and privileged access to the Father — to live as truly free sons and daughters in the Eternal Son made man. Msgr. Michael Heintz, Ph.D., a priest of the Diocese of Fort Wayne-South Bend, Indiana, is academic dean at Mount St. Mary’s Seminary in Emmitsburg, Maryland. Comments Off on Do You Take Sin Seriously? Sin is for the most part a leap in the dark. A man knows he is doing a dangerous thing, but he does not realize the full danger. He does not take in the full scope of his action, nor its complete consequences. St. Paul speaks of “the deceitfulness of sin” (Heb 3:13). The expression describes very well the source of that disappointment and unhappiness which often overtake the transgressor when he finds himself involved in difficulties from which it is all but impossible to extricate himself, and sorrows that he never anticipated. Do you think that young people who develop habits of sin that undermine their health know all they are bringing on themselves: the weakness of body, the feebleness of mind, the early decay, the shame, the remorse, the impotence of will, the tyranny of passion, the broken vows and resolutions, the hopelessness, the fear — perhaps the premature disease and death? No, all this was not in their thoughts at first. These are the bitter lessons that [youths have] learned in the school of sin. When the thieving businessman yielded to the glittering temptation, and made himself rich for a while with dishonest riches, did he then see before him the deeper poverty that was to follow? Did he envision the loss of all that makes a man’s heart glow and his life happy? Did he see the lies he must tell, the subterfuges he must resort to, the horrible detection of his crime, the loss of situation, the public trial, the imprisonment? No. Of course, these possibilities were all daily in his thoughts, for they were part of the risk he knew he was running. But so little did he bring them home to himself, and the suffering he was to endure, that when they came it seemed almost hard, as if a wholly unlooked for calamity had overtaken him. Wherever we look we find the same thing. Men imagine sin to be a lesser evil than it really is. It is so easy to commit it, it is so soon done, the temptation so strong, that it does not seem as if such very bad consequences would come of it. So it is done, and the bitter consequences come. Before you allow yourselves to act on this estimate of sin, so prevalent in the world, ask yourself how it accords with God’s estimate of sin. That is the true standard. God is Truth. He sees things as they are, and everything is just what He considers it to be. What, then, is God’s estimate of sin? Look at the Cross, and you will have the answer. “He was wounded for our transgressions, He was bruised for our iniquities; upon Him was the chastisement that made us whole, and with His stripes we are healed” (Is 53:5). He suffered death because we deserved it. He was accursed because we had made ourselves liable to the curse of God. Hell had its hour of triumph over Him because we had made ourselves its children. Can anything show more than this what a mysterious evil sin is, that it is an offense against God, an assault upon His throne, an attack upon His life, an evil all but infinite? All the other expressions of the evil of sin — the cries of misery that it has wrung from its victims, the warnings that natural reason has uttered against it, the tender lamentations with which the saints have bewailed it, the penalties with which God has threatened to visit it — all pale before the announcement that God sent His Son into the world to die for it (see Jn 3:16). Father Francis A. Baker (1820-1865) was a preacher of the Missionary Society of St. Paul the Apostle. This excerpt comes from “The Cross, the Measure of Sin,” published in his collected sermons in 1896.